Location-sharing gets an innovative new approach today from the Bing team in the form of "Who&apos;s In?" for Windows Phone 7. The app is different from other location-based options in that its based on specific, temporary events. Let&apos;s say you and three friends are meeting up to go to a free concert. One of you can create an event in Who&apos;s In? and then invite the other three. Everyone who agrees to be "in" will show up on the Who&apos;s In? map along with their profile photo and status, which they can continuously update. This way, you can stay updated on your friends&apos; progress as you all make your way toward the concert. Events have a set time limit, so your location will only be displayed to other invitees for the allotted time period. Plus you can opt to leave an event whenever you want. 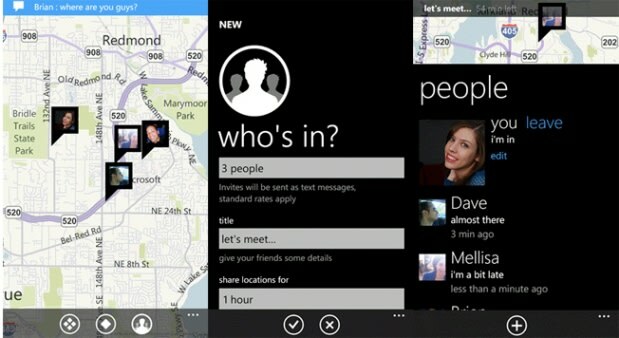 Sounds like another winner for Windows Phone, to us. Get it now in the Zune Marketplace.